UNSURE OF HOW TO CELEBRATE CHRISTMAS WITH YOUR TEAM THIS YEAR? 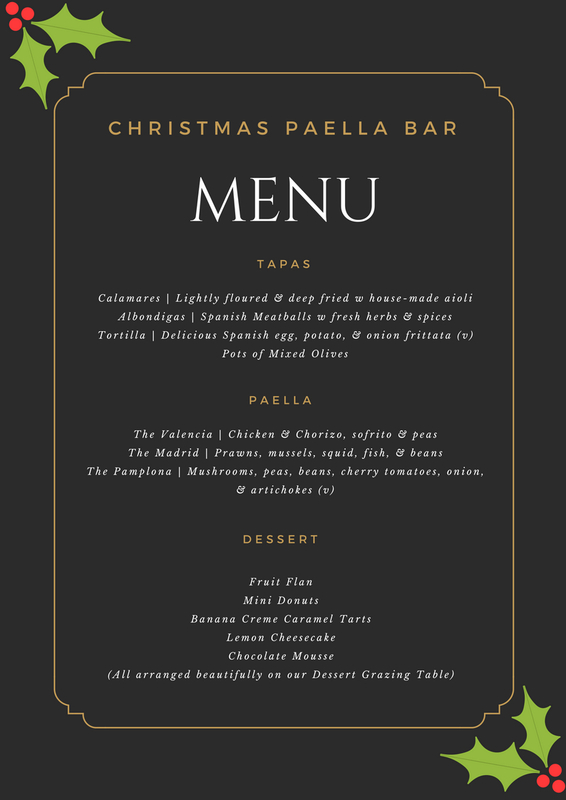 IF YOU ARE A SMALL BUSINESS WANTING A BIG PARTY, BOOK A TABLE AT OUR CHRISTMAS PAELLA BAR NIGHT ON 14TH DECEMBER 2018! FEATURING A CELEBRATED DJ, DANCE FLOOR, DECKED OUT EVENT SPACE, STYLED TABLES, SCRUMPTIOUS TAPAS, AN AMAZING ALL YOU CAN EAT PAELLA BAR, DESSERT GRAZING TABLE, AND FULLY SERVICE BAR WITH DRINKS FOR PURCHASE (or bar tab option available), YOU WILL HAVE THE EVENT OF THE YEAR WITHOUT BREAKING THE BUDGET! DOORS OPEN AT 6:00PM.